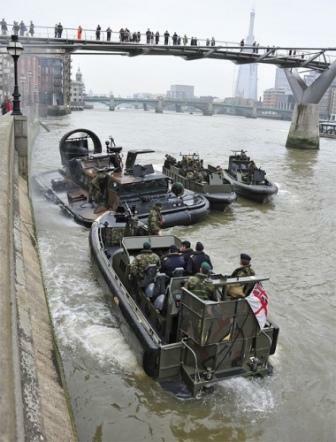 Yesterday’s demonstration of military versatility on the River Thames yesterday suffered an embarrassing hiccup when a hovercraft crashed into Blackfriars Bridge. 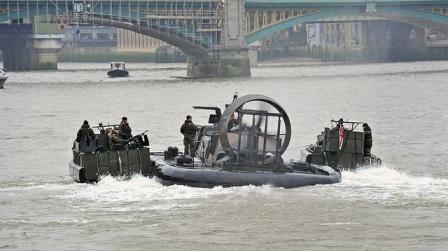 The Royal Marine Commando LCAC hovercraft was taking part in a number of displays as part of a capability demonstration by HMS Bulwark, currently moored at Greenwich. 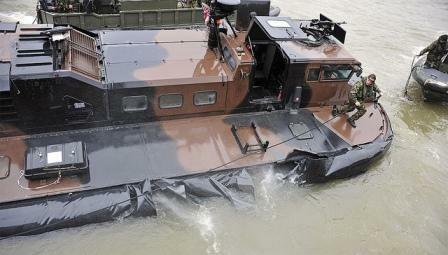 The amphibious vehicle, used by 539 Assault Squadron Royal Marines, had been been going up and down the river as part of its demonstration when it was involved in an incident which damaged the starboard skirt. Mike Paternott, who works nearby and took these pictures, said it struck Blackfriars Bridge at about 2.40pm. Spectators from the Millennium Bridge watched as the damaged craft drifted onwards and was eventually towed away by two Marine fast boats. See more pictures at Mike Paternott’s Flickr account. All images remain copyright of Mike Paternott. You should not write about this incident. Think about youngsters, public and criminals. You gave them reason to laugh and bullying navy and similar establishments. Could you write about your accidents and incidents at work on the go, one by one, about your profiles and how much you differ from marines and what are your morals? I don’t really get the point of your comment. He is simply referring to an incident in which no specific marine was harmed nor ridiculed. You need to chill out and respect this awesome blog for what it is instead. Thomas/fly til London or member of publisher team – who ever you are, not many journalist wrote about this incident. It speaks for it self. My point was write about what they were doing there, why, when. Not about trip over behind the scene or even on the scene but about the spectacle as a whole. WELL ITS BEEN 4 YEARS SINCE YOU WROTE THIS ZBYSZKO, AND I WONDER IF YOU HAVE MATURE BY NOW, OR IF YOU STILL HAVE THE SAME MORONIC OPINIONS. YOUR COMMENT WAS SO IDIOTIC THAT I HAD TO ANSWER, EVEN THOUGH IT HAS BEEN SO LONG SINCE YOU WROTE IT. YOU PROBABLY ARE A MILITARY OR POLICE PERSONNEL YOURSELF, AND A LOW RANKING ONE AT THAT, JUDGING FROM THE LEVEL OF INTELLIGENCE, OR LACK THERE OFF, THAT YOUR COMMENT SUGGESTS. I UNDERSTAND THAT YOU WOULD LIKE TO LIVE IN A REPRESSIVE, FASCISTIC POLICE STATE WHERE PEOPLE IN UNIFORM CAN TELL CIVILIANS WHAT TO SAY, WHAT TO WRITTE, WHAT TO THINK, AND SO ON. WELL THANK GOD FOR FREEDOM OF EXPRESSION, AND LAWS AND CONSTITUTIONS THAT PROTECT US CIVILIANS FROM STUPID GONHO MILITARY FREAKS LIKE YOU. I YET HAVE TO SEE YOUNGSTERS, (THE) PUBLIC AND CRIMINALS BULLYING THE NAVY, IT USUALLY GOES THE OTHER WAY AROUND.